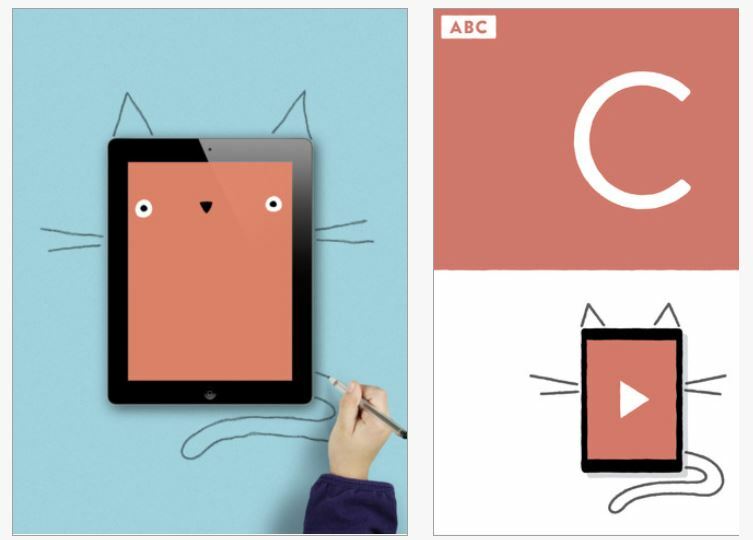 Drawnimal app (1.99) is a new twist for drawing on paper (yes, hard copy paper…) and learning letters with your iPad or iPhone. Yes, this caught my attention also, read on and you’ll understand this new mix of hard copy drawing with your iPad/iPhone. Place your iPhone on a sheet of paper or any surface you can draw on. Draw around the iPhone as shown on the screen. Press play to call up the animal! Tap the screen for a surprise! Draw part of the animal components and leave the components that the students can do, such as have them finish the last part using reversed chaining technique. Scaffold completion of the task by drawing the components that are difficult then allowing the student to draw components that they can be successful at such as drawing the straight lines or if working on diagonals have then fill in those parts as appropriate to the animal selected. Knowing the level of difficulty each letters present can help choose letters that have components you are working on with a student. Trace the lines of the animal being created with a dotted line or highlighter. Have the student trace over the lines. Have the student also draw the face or components such as eyes displayed on the iDevice on the paper also. Include drawing the letter, reinforcing the proper formation reinforced in the classroom. Whole words or sentences can be added to the drawing. Add other details to the picture as is appropriate to the level of the student. Create a alphabet book of all of the letters. Basic instructions are available in a Parent menu available within the app. More information can be found on the Drawnimal.com website. Similar to step by step drawing apps provided on with your iPad this provides drawing on paper, the ability to use the drawing implement or grip of your choice (crayon, pencil, marker, pen of a variety of sizes, grippers or weight. Would you use this in your OT or teaching iTool Kit? This entry was posted in App Reviews, Apps for OT's, Apps for Special Needs, AT for Handwriting, Drawing, Early Childhood, Elementary School, Handwriting, iPad, iPhone, iPod, Letter Formation, Occupational Therapy, Pediatrics, Uncategorized, Visual Memory, Voice Recognition and tagged App Review, apps for visual perception, Drawing, Early Childhood, Fine motor apps, Handwriting, iPad, iPhone, iPod, occupational therapy, OT Apps, special education, special needs students, Visual motor apps. Bookmark the permalink.